Click here to zoom in. The World Bank Group, with the support of Japan, Germany and the World Health Organization, has developed the Pandemic Emergency Financing Facility (PEF), a quick-disbursing financing mechanism that provides a surge of funds to enable a rapid and effective response to a large-scale disease outbreak. Eligible countries can receive timely, predictable, and coordinated surge financing if affected by an outbreak that meets PEF’s activation criteria. The PEF breaks new ground by providing the first-ever insurance for pandemic risk, offering coverage to all low-income countries eligible for financing under IDA. The PEF is an essential part of the World Bank Group’s (WBG) overall commitment to helping countries be better prepared for and able to respond to pandemics as well as our ability to handle the next pandemic on a global level. Pandemics are one of the most certain risks the world faces, with enormous costs. A severe pandemic can result in millions of deaths, and even the most conservative estimates suggest that pandemics destroy up to 1% of global GDP, which is comparable to other top-priority threats, such as climate change. It’s been estimated that the annual global cost of moderately severe to severe pandemics is roughly $US 570 billion, or 0.7% of global income. 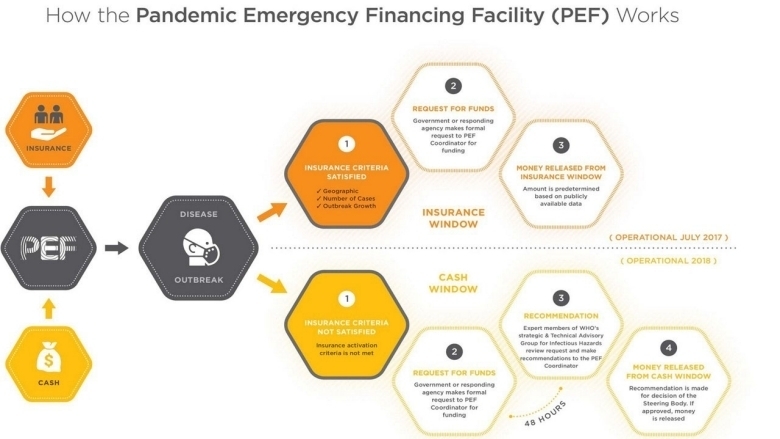 What is the Pandemic Emergency Financing Facility?